SoftStep weighs just a pound and is 17.5 inches long. 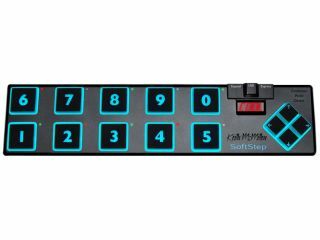 Keith McMillen Instruments has released SoftStep, which it's describing as "the first universal multi-touch USB/MIDI foot controller". Looking like a distant cousin of Korg's nanoSeries, this offers ten sensor keys that support five degrees of motion. So, movements such as up/down, left/right and rotary motions can be used to control your effects. Other features include a four-direction navigation pedal, an alphanumeric LED display and backlit keys. MIDI is sent over USB (though you can add a dedicated MIDI expansion module) and there's an Expression port. As well as being suitable for use by guitarists as pedalboard controller, the SoftStep is also designed for laptop musicians and DJs. It's available now either directly from Keith McMillen Instruments or retailers and is priced at $289.